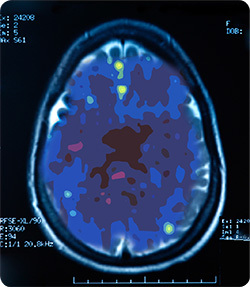 A PET scan measures vital functions such as blood flow, oxygen use and blood sugar (glucose) metabolism. 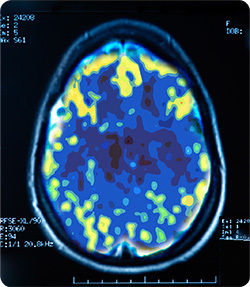 You see in the above graphic the difference in brain activity of that a patient with depression attribution. Depression can be a lethal disease. In fact, each year in the US, over 30,000 people die by suicide, 60% of whom suffer from depression.4 Overall, women are almost twice as likely as men to suffer from depression; however, some experts feel that depression in men is under-reported.5 Depression can affect anyone; it has no racial, ethnic or socioeconomic boundaries. About two-thirds of those who experience an episode of depression will have at least one additional episode in their lives. While the exact cause of depression is not known, the leading scientific theory is that depression is caused by decreased activity in the neural networks of the brain that regulate mood. More than 4 million patients do not receive adequate benefit from antidepressants and/or cannot tolerate the side effects caused by them. For these patients, Transcranial Magnetic Stimulation (TMS) is a new depression treatment — a breakthrough for patients with drug resistant depression and mood disorders.